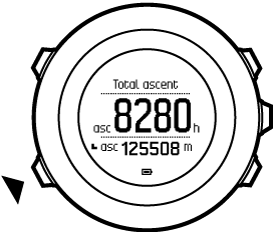 Suunto Ambit3 Vertical monitors your overall ascent history based on your recorded Moves. 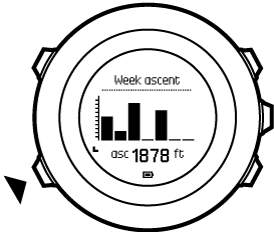 The ascent history gives you a complete picture of your elevation gain, from each day to your all-time gain. The ascent history is a default display you can access by pressing Next. For more information about showing or hiding displays, see Displays. In the ascent history display, you have four views you can scroll through by pressing View. The view shows your elevation gain over the last seven days with today furthest to the right. 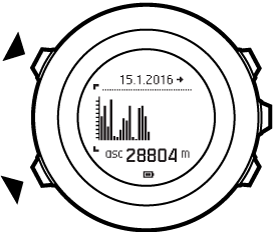 The next view shows you elevation gain over 30 days starting from the date indicated at the top of the display. You can reset the start date to today by pressing Back Lap. After the 30-day view you get a summary for the current calendar year, with each column on the graph representing one month. 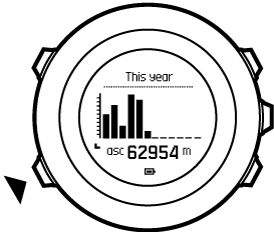 The last view shows your all time elevation gain (for as long as you have used the watch). The middle row shows your total ascent time, and the bottom row shows your total elevation gain.